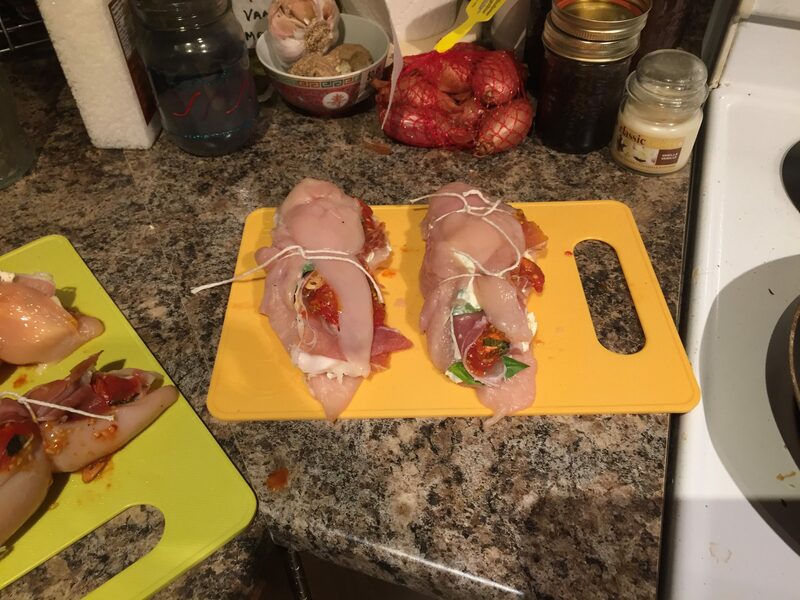 Spread 1/4 cup of cream cheese on each butterflied chicken breast. 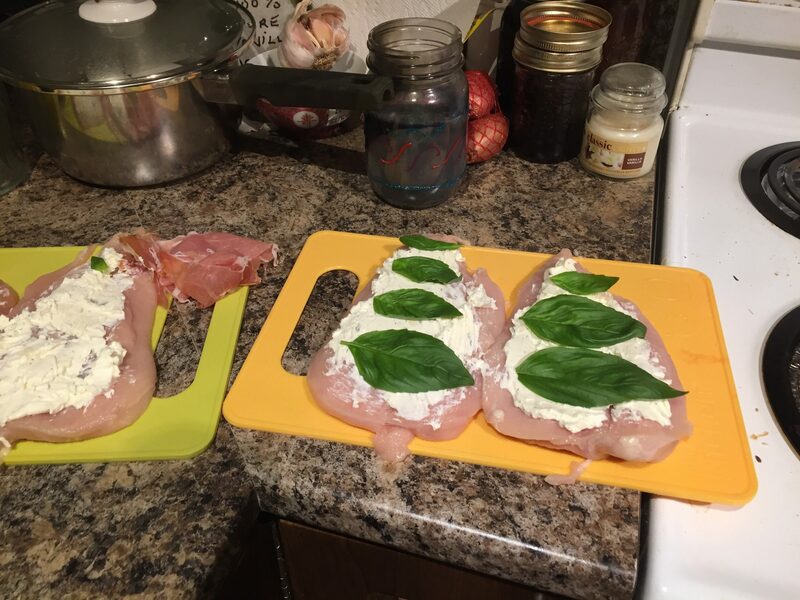 Cover each breast with basil leaves. 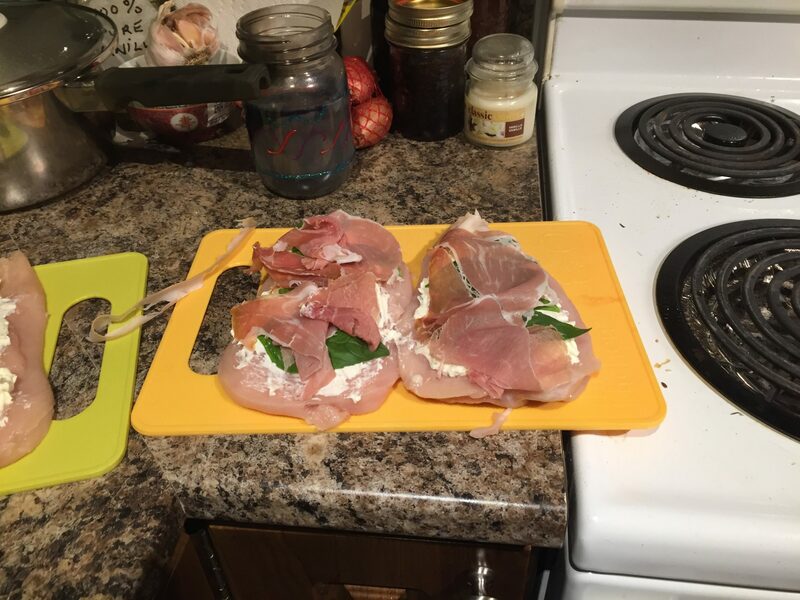 Add 2 slices of prosciutto to each breast. Top each with the homemade oven-dried tomatoes. Fold the top back over and tie with cooking string. 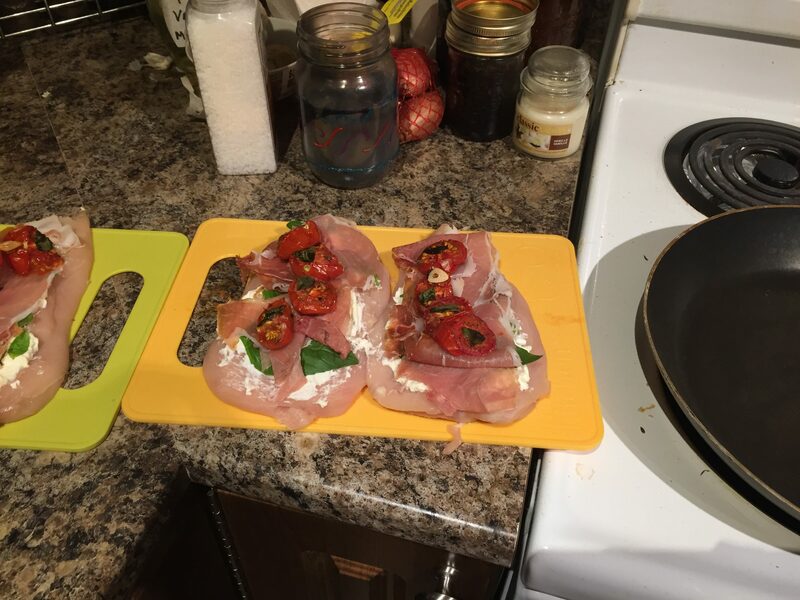 Place breasts in an oven-safe pan with olive oil and sear the edges until golden brown. 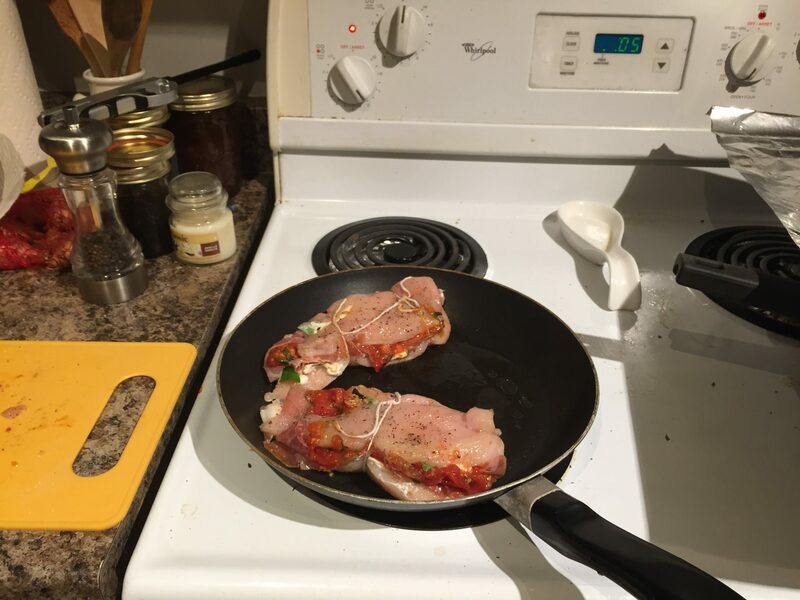 Put the pan in the oven at 350 F until chicken is fully cooked through (30-60 minutes depending on the size & thickness of the breasts–keep an eye on them after 30 minutes). Serve, either whole or sliced. The ratios below are for the ENTIRE RECIPE, which serves 4-8 people depending on whether you want to enjoy a delicious meal that follows this way of eating, or whether you prefer to eat a small portion with different sides to better fit your macros for weight-loss. Either way, at less than 10 grams of carbs per serving (full breast), you have no excuse not to splurge on this amazing low carb meal! 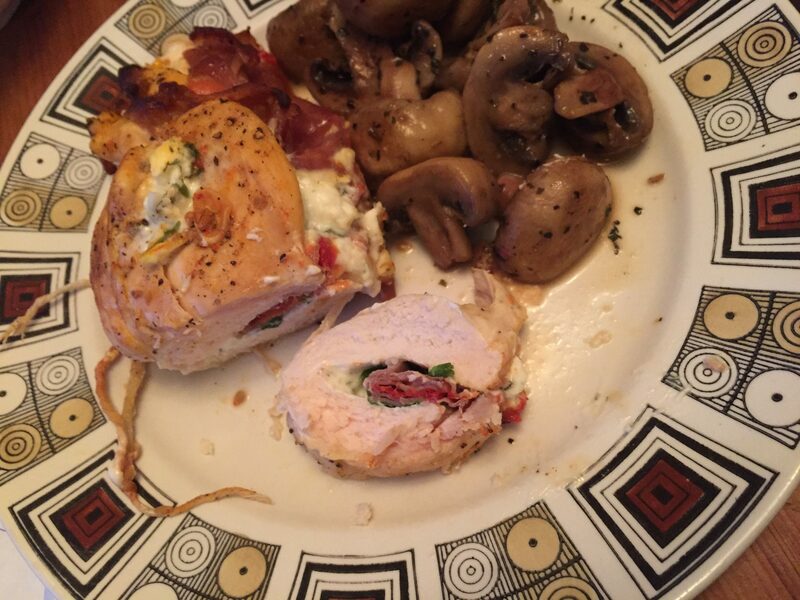 For those who need a fattier option, you can add a chunk of butter before folding the breast shut, and drizzle the oil from the pan over top of the plated stuffed chicken breast. You can also simply pair it with a fattier ratio side. I chose butter sauteed mushrooms because YUMM! The alternate option is to only use 2 breasts, slice them in half like a bagel to make 4 thin ‘breasts’, and flatten them with a mallet to lower the amount of protein, and proceed with everything else the same.